The nanocrystalline/nanoscale ternary FeCoNi alloys are known to have an excellent combination of soft-magnetic properties and thermal stability and they find applications in various miniaturized devices, e.g. sensors and actuators. A medium-entropy nanocrystalline Fe46Co34Ni20 alloy was synthesized by mechanical alloying. The x-ray diffraction and scanning electron microscopy were adopted for their structural characterization at ambient temperature. The alloy powder was comprised of two phases: an f.c.c. phase (γ) and a b.c.c. phase (α-Fe). The powder particles were irregularly shaped and, the mean and D90 of the powder particles was ~5 μm and ~10 μm, respectively. The grain size was less than ~10 nm. The intrinsic coercivity and saturation magnetization of the alloy powder was ~3 kA/m and ~164 Am2/kg, respectively. 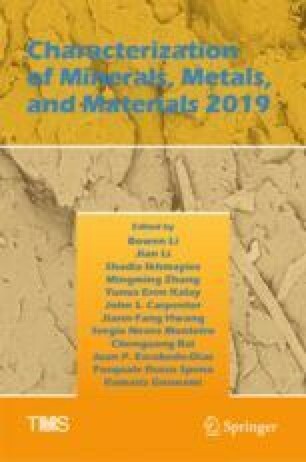 The nanocrystalline alloy powder exhibited superior soft-magnetic properties—magnetization increased by ~24% and the coercivity decreased by ~16 times—as compared to the nanoparticles of a similar composition, synthesized by chemical methods. Thermal treatment at 840 K resulted in an improvement in the soft-magnetic properties of the mechanically alloyed powder—saturation magnetization increased by ~13% and intrinsic coercivity decreased by ~33%. The authors thank the College of Engineering and Computer Science and the Institute of Advanced Vehicle Systems at the University of Michigan in Dearborn for the financial (Grant# U052349) and infrastructural support to conduct the experimental work.